Reflections of growing up Indigenous in Saskatchewan, in light of the Colten Boushie trial. For Canada to move on the journey of reconciliation, it first needs to come to terms with its racism problem. ...Her dual graduate degrees have informed her views on how reconciliation can be made meaningful for her generation — and not become an empty term of well-intentioned sentimentality. canada letter: it's july 1. let's party. wait, why today? 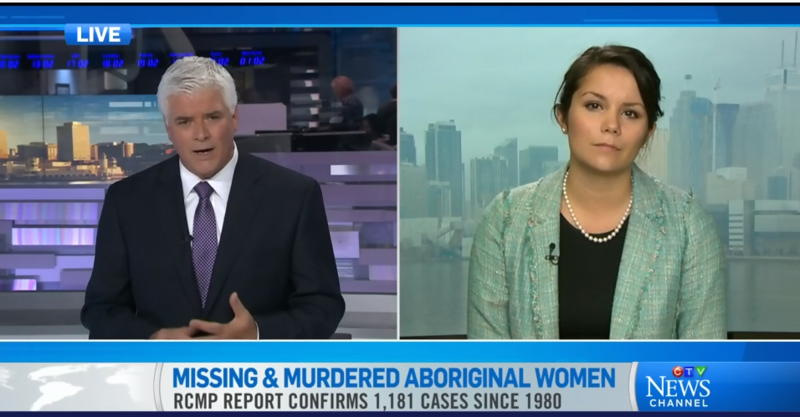 In the wake of the RCMP report on Murdered and Missing Indigenous women, Gabrielle Scrimshaw provides a commentary as to why a national inquiry is needed on CBC's Power and Politics. While turning to immigration has been highly controversial and raising the birth rate seems far fetched (imagine, a national child care plan! ), one possible solution stands out as inherently logical: acknowledging the sole demographic that is already growing. Reconciliation: A new generation of aboriginal Canadians weighs in​. 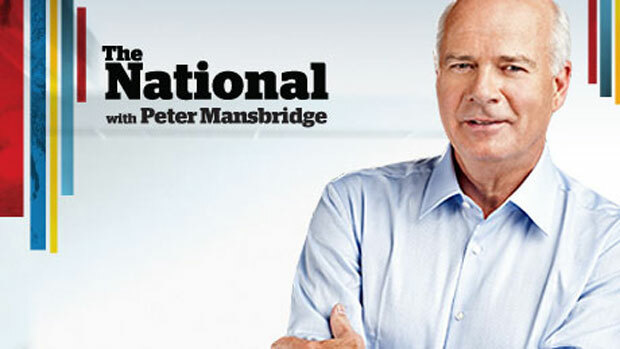 ​Reconciliation makes good business sense, says Scrimshaw. 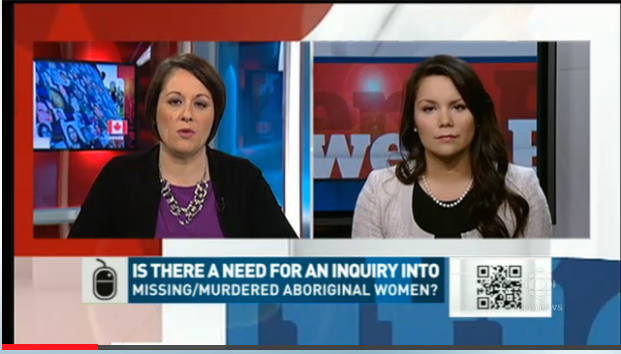 In the wake of the RCMP report on Murdered and Missing Indigenous women, Gabrielle provided a commentary to a national audience. 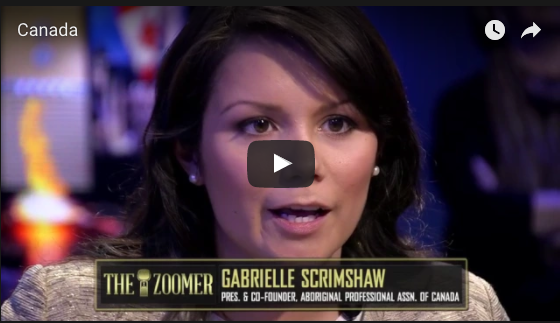 Appearing on a panel moderated by Conrad Black and Denise Donlon, Gabrielle discusses the role of Indigenous people in the founding and growth of Canada. Gabrielle was interviewed on CBC’s The National, discussing Reconciliation and the way forward for Canada's indigenous relations. Between 2001 and 2026 an estimated 600,000 Aboriginal youth will enter the workforce in Canada. They call themselves Concrete Indians: Aboriginal families who live in urban areas. According to Census data, it’s a growing trend. Much of the news reporting on Canada’s aboriginal community highlights the challenges indigenous people face. ​But then along came Idle No More. Gabrielle was interviewed on her way to receive the 2013 Indspire youth award. In the interview she talks about her work with APAC and gives advice for Indigenous youth. The world Gabrielle knew growing up in Duck Lake, Saskatchewan was small, but her dreams were big. Encouraged by a childhood mentor, Gabrielle set off to discover the world. Ahead of the Prime Minister's meeting with First Nations leaders, we take a look at the Idle No More movement. Joining us are Gabrielle Scrimshaw, Tom Flanagan, Keith Beardsley and Wab Kinew. Matt Galloway spoke about the growing movement with Cynthia Wesley-Esquimaux and Gabrielle Scrimshaw. “Everyone loves a good story . . . everyone is a good story,” says Danish journalist and social activist Ronni Abergel, one of the founders of the 6th annual International Human Library Day that unfolds Saturday in libraries. ​There is, however, another class of corporate change-makers – micro-social intrapreneurs – who are quietly helping their corporations do more good. The “Faces of CivicAction” are 10 volunteers who represent a cross-section of people working with the group that brings together community leaders to tackle the region’s social, economic and environmental problems. ​Gabrielle was selected as one of fourteen outstanding Indigenous achievers in Canada by Indspire (formerly the National Aboriginal Achievement Foundation). A newly formed organization that provides leadership support to young Aboriginal professionals is example of 'entrepreneurial volunteerism' happening through CivicAction's Emerging Leaders Network. Matt Galloway spoke with Gabrielle Scrimshaw. She is co-founder and president of the Aboriginal Professional Association of Canada. For a young woman with serious ambition there are far worse situations to be in than being gently and persistently pressed by Charlie Coffey to join the ranks of his former employer, the Royal Bank of Canada.